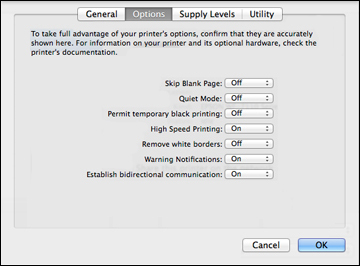 If a blank page exists in a document you are printing and you want to skip printing it, select the Skip Blank Page setting in your printer software as instructed below. Select the Maintenance tab, then select the Extended Settings button. In the Settings area, select the Skip Blank Page setting or checkbox. Select Print & Scan, Print & Fax, or Printers & Scanners, select your product, then select Options & Supplies.